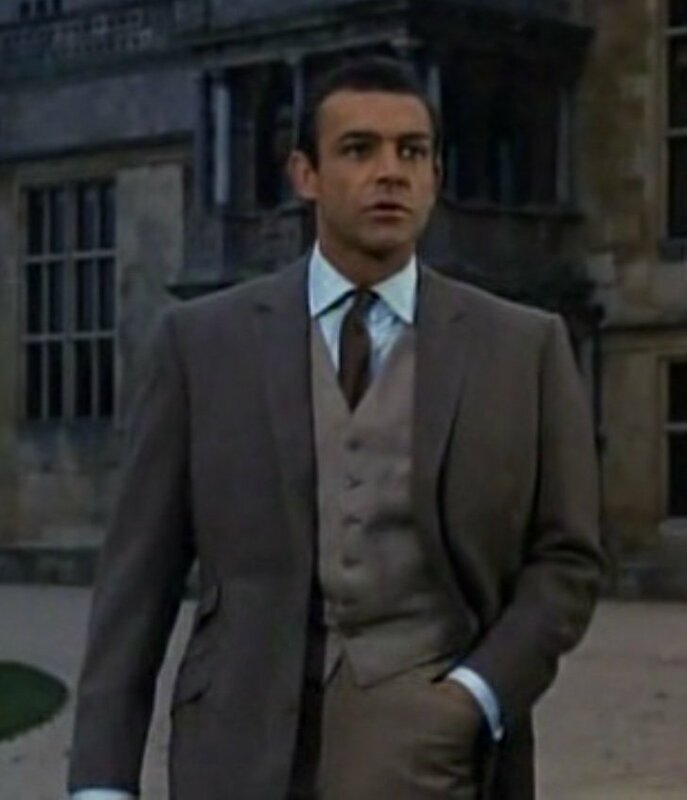 In 1964, Sean Connery starred in a crime thriller called Woman of Straw, and it features many of the same clothes that Connery wears a few months later in Goldfinger, including suits and dinner jackets most likely made by Anthony Sinclair. 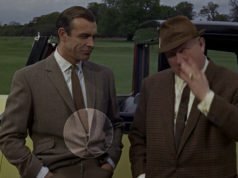 The classic brown barleycorn hacking jacket that we see in Goldfinger and Thunderball also appears in this film. It could possibly be a different piece altogether, but the resemblance is striking. It would seem odd that the Bond films would use leftovers from another film, though it may have been planned this way. 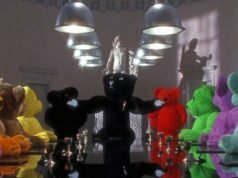 The clothes in this film didn’t see nearly as much wear as they did in Goldfinger, and the production could save money and time by using perfectly good suits already made. 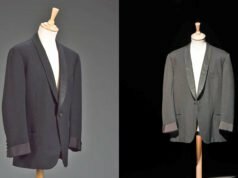 Connery wears both the hacking jacket as well as the tan cavalry twill trousers with frogmouth pockets that are later seen in Goldfinger and Thunderball, but what he wears them with is different. The shirt is the same style as the shirt in Goldfinger, with a spread collar and double cuffs, but in sky blue instead of ecru. Connery wears a solid brown tie, tied in a four-in-hand knot, and he wears the same waistcoat seen in Goldfinger under the houndstooth suit from M’s office. The beige wool waistcoat has a 6-button front, and Connery closes all the buttons. The bottom button isn’t supposed to be buttoned on this waistcoat and it causes the bottom to bunch up and pull. Later I will be writing about other clothes from Woman of Straw, whether seen in Goldfinger or just exclusive to this film. That is uncanny how similar this is to what he wears in Goldfinger. I don’t know if it’s the exact same jacket, trousers, or waistcoat, but the overall look is the same. There’s plenty more in the film that is identical to what Connery wears in Goldfinger. I think there’s too much in common for it to be a coincidence. A great look, I’d say. I particularly like the cut of the jacket. The bottom button on the waist coast looks sloppy, as you said, but that’s the only flaw I see. I don’t think any Bonds produce such a wide range in results as Connery. When he gets it right, he looks great but he also has dreadful mistakes like that pink tie in Diamonds are Forever or the time he walked around with the bottom button a 2 button jacket done. I really like this outfit, it does look great 50 years later. The possible use of this jacket in two movies, piqued my curiosity, so I looked into the chronology. I cannot say i expected to find an answer, but I must say I am surprised at how quickly these movies were made. 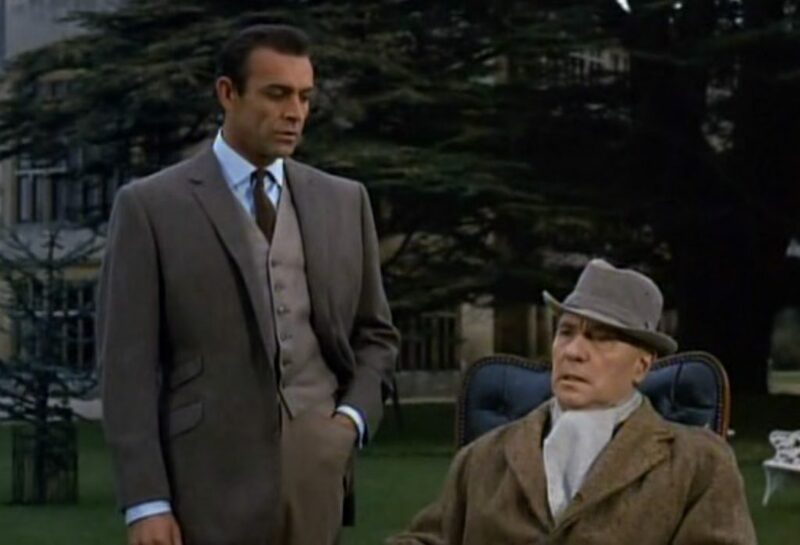 It would appear that the jacket/suit etc, would have had to be ordered before or during filming of From Russia with Love, as Connery didn’t take any time off between Wos and FRwL. To complete 4 movies in under 20 months is just staggeringly fast. I think this means they almost have to be the same clothes. So is it safe to say that in order to go from woman of straw to james bond is basically just changing the shirt and necktie? Could it also be Sean Connery had a part in the suit being reused? If I understand correctly from the previous articles, actors sometimes got to keep their clothes, right? Thus the basis of the initial question. If Connery got to keep these clothes, they would not have been used in another production. A deal was likely made so that Goldfinger could use the clothes made for Women of Straw. Possibly the clothing budget was shared.